In this first aid blog post we’ll look at an uncommon, but important, cause of back pain – Ankylosing Spondylitis. 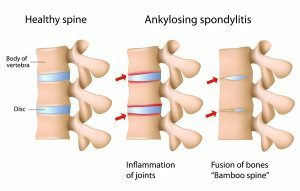 Ankylosing spondylitis (AS) is a painful, progressive, rheumatic disease. It mainly affects the spine but it can also affect other joints, tendons and ligaments. Other areas, such as the eyes, lungs, bowel and heart can also be involved. Ankylosing means ‘fusing together’. Spondylitis indicates inflammation of the vertebrae. Both words come from the Greek. AS describes the condition by which some or all of the joints and bones of the spine fuse together. Entire fusing of the spine is unusual. Many people will only have partial fusion, sometimes limited to the pelvic bones. Inflammation occurs at the site where certain ligaments or tendons attach to bone. This is followed by some erosion of bone at the site of the attachment (enthesopathy). As the inflammation subsides, a healing process takes place and new bone develops. Movement becomes restricted where bone replaces the elastic tissue of ligaments or tendons. Repetition of this inflammatory process leads to further bone formation and the individual bones which make up your backbone, the vertebrae, can fuse together. What are the signs and symptoms of AS? AS sometimes causes aching, pain and swelling in the hips, knees and ankles. Indeed, any joint can be affected. In most cases the pain and swelling will settle down after treatment. The heel bone can become particularly troublesome causing pain in two areas. Most common is the under surface, about three centimetres from the back of the foot. This is called plantar fasciitis and can last for many weeks. It may respond to an insole for the shoe designed to take weight off that part of the heel. The less common pain arises at the back of the heel where the Achilles tendon is attached to the heel bone. Pressure from a shoe may aggravate the pain. Over 80 per cent of people with AS take non-steroidal anti-inflammatory drugs (NSAID), such as ibuprofen and diclofenac, to reduce inflammation and relieve pain and stiffness. However, some people may experience side-effects with NSAIDs and prefer to take simple pain killers such as paracetamol.